The Jewish Homeland of 1920's League of Nations giving Britain the Mandate to create it and suddenly in April 1921 the major part became Transjordan-Arab land which was 80% of the land. It had become a British protectorate. Then it became Jordan, an Arab state in March 1946. 2 years before Britain's mandate was finished and they departed from what was to be called Israel in May 1948. The "Palestinian" Arabs want a state carved out of Israel, who were the Palestinian Jews. They have not wavered one bit in their demands. The Palestinian Arabs are not a tribe, such as Hashemites of Jordan were, who have been forced to take in many Palestinian Arabs. They came from all the neighboring states of Israel. They were created out of the bungling of England who held the mandate and who were given the order of creating the Jewish Homeland. However, England had other ideas, and flooded Palestine with Arabs during the time when Jews, who were escaping from Germany's Hitler needed a safe haven and were denied entrance. 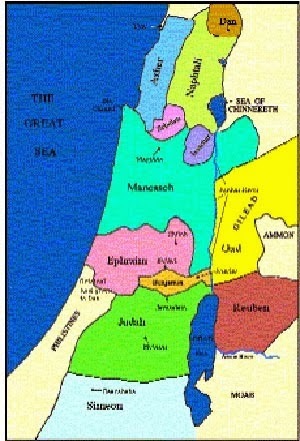 The 12 Tribes of Israel's designated section of Canaan when Joshua entered the land in 1271 BCE. Here's what the Palestinian Arabs continue to demand in their "peace" discussions with Kerry. 1. The will not accept Israel as a Jewish state. 2. They will not accept the borders of 1967 created when all the Arab nations attacked Israel and lost. 3. They will not accept any Israelis on Palestinian land or at border crossings and expect all Jews to get out of Judea and Samaria. They keep saying it will be Judenrein! 4. They demand the "right of return" for millions of Arab refugees and their descendants to ISRAEL. Israel and Judea-Samaria; to become Palestine through peace negotiations. Called "West Bank" by Jordan. This leaves some of the narrow sections of Israel to be from 6 to 9 miles wide. What part of any one of these demands is not seen as asinine and impossible for Israel to agree to? Has Israel just lost a war we are not aware of and in the position of ceding everything they have struggled to have for the past 65 years? What the Palestinians have done after Israel left Gaza has been to have their own squabble as to who is their leader with Hamas terrorists winning that round and kicking out Fatah into Judea and Samaria. They are a divided group to start with and did not abide by the peaceful terms of which Israel left Gaza. That was for peace between the two entities. It turned out to be just the opposite. The Arabs have bombarded southern Israel since 2001 with rockets, mortars and missiles. They do not keep their word and are not a peaceful people. Their agenda or charter is that of the Muslim Brotherhood of which Obama was promoting in the Cairo talk after becoming president. He continued to favor them throughout the Arab Spring which took place in Egypt with Morsi, a Muslim Brotherhood president, was "elected." He has withheld monies from Egypt due to their getting rid of Morsi, still showing favoritism for a group who are ready to wipe out Israel. This doesn't give much credence for Kerry being aware of all the pitfalls that the Palestinians are throwing at Israel. My fear is that he is actually very much aware of the absurdity he is expecting just to make a name for himself as some sort of peace mediator. No one is more tired of the calamity of Palestinians wanting their own state, that being part of Israel, than Israel is. We know that Europe and the USA are tired of the badgering of the past 65 years, but they are not in harm's way because of it. Israel is. Had England carried out the mandate as so expected in the first place and had showed some spine with the Palestinians, their warring would never had carried on for so long. In fact, according to the efforts of research of Joan Peters in her book, "From Time Immemorial," the British brought in more Arabs. They have not been shown the boot. Whereas Jews had to wait 2,000 years to get their own land back once again, the surrounding nomadic Arabs were only thinking of having a land for the first time in 1967 at the encouragement of the Arab countries who failed to win their aggressive battle against Israel then when they attacked this fledgling state of determined people who put their faith in G-d to help them. The Palestinians were offered the chance to have their own state by the British in 1948 and they have refused up to 1967. That's when they tested the world and called the shots, and they saw that they still had clout. The world, so afraid of being shut out of an oil resource, is afraid to raise their voice to the Palestinians, who are backed by all their Arab brothers. It's either that or the world is still so anti-Semitic that they can't see that Israel is being screwed again in these ridiculous peace talks that are going nowhere. The first requirement for peace talks should be that the Palestinians are willing to accept Israel as a Jewish state. That's it. That's what it is. Sadat came to Jerusalem and made peace between Egypt and Israel. Jordan has been peaceful for the past 41 years. There is no indication that the Palestinian Arabs even want to be peaceful. They're still spokesmen for the Muslim Brotherhood who have not accepted peace with Jews. Just look at their demands. Reference: http://www.israelnationalnews.com/News/News.aspx/174909#.UuRJjdLTlkg How to fight back when the media blames Israel for destroying peace talks.